12 Sovereigns minted during the reigns of Queen Victoria, Edward VII and George V and struck at the London, Melbourne, Perth and Sydney mints. 2% discount if payment is via BACS. During the 1800s, the Royal Mint opened three branch mints in Australia purely for Sovereign production. All three branches were in operation during the reigns of Queen Victoria, Edward VII and George V and this collection brings together twelve Sovereigns from that era – four from each reign. Each set of four comprises one Sovereign struck at the Royal Mint at Tower Hill in London, accompanied by one struck in each of the branch mints at Sydney, Melbourne and Perth. The London Sovereigns carried no identifying mark, but the Sovereigns struck overseas were distinguished by a special mintmark, the initial letter of the city of origin, on the reverse. All twelve Sovereigns feature Benedetto Pistrucci’s classic depiction of St. George slaying the dragon and the mintmark can be found on the ground line below the rear hooves of St. George’s horse. 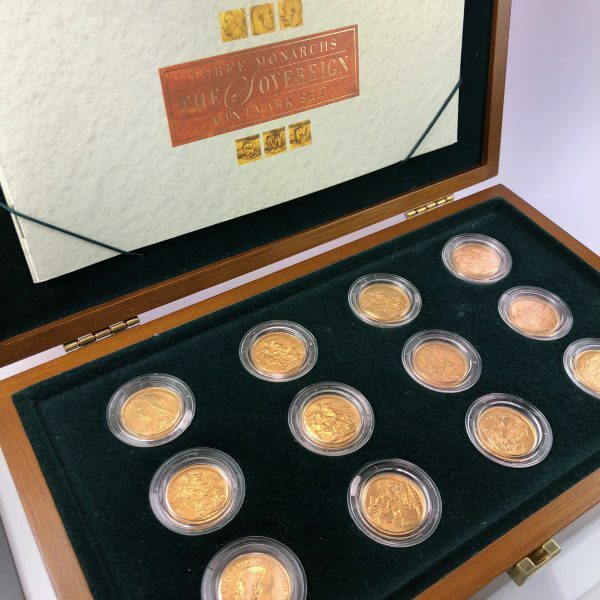 Each Sovereign is encapsulated in its own perspex case and housed in the original Royal Mint presentation box, complete with the original Certificate of Authenticity and Ownership record. If purchased via bank transfer, the price quoted will be discounted by 2%. Insured shipping is also included.